산호동굴은 총 길이가 약 1.7㎞에 이르는 대형동굴로 동굴생성물 중 하나인 동굴산호가 동굴 내부에 두루 성장하고 있으며, 다른 동굴에서는 관찰할 수 없는 대형 동굴산호가 잘 발달해 있다. 동굴산호 이외에도 종유석, 석순, 휴석, 유석, 곡석 등 다양한 동굴생성물이 성장해 있으며, 특히 대형석화가 동굴산호로 전이되는 매우 특이한 동굴생성물이 성장하고 있어 학술적, 자연유산적 가치가 매우 높다. 현재 산호동굴은 동굴 생성물 등의 보호를 위해 공개제한지역으로 지정되어 있어 관리 및 학술 목적 등으로 출입하고자 할때에는 문화재청장의 허가를 받아 출입할 수 있다. Sanhodonggul Cave is a large cave extending close to 1.7㎞ in total length. Cave corals, a type of mineral deposits (speleothems) found inside caves, grow across its expanse. Some of the cave corals found here are of sizes that are seldom encountered in other caves in the Korean peninsula. 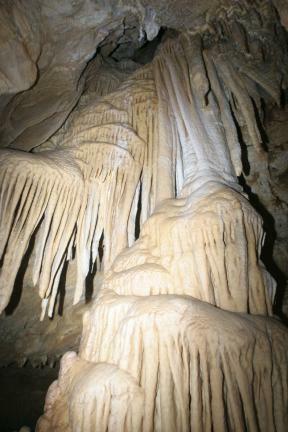 A variety of other speleothems, such as stalactites, stalagmites, rimstones, flowstones and helictites, also grow in Sanhodonggul Cave. Of particular interest are the transitional formations between cave flowers (anthodites) and corals, which further increase the scientific significance of this cave as well as its value as natural heritage. To protect these cave formations, access to Sanhodonggul Cave is currently restricted. A prior approval by the Cultural Heritage Administrator is required to visit this cave, whether for its maintenance or for research purposes.